It's official. 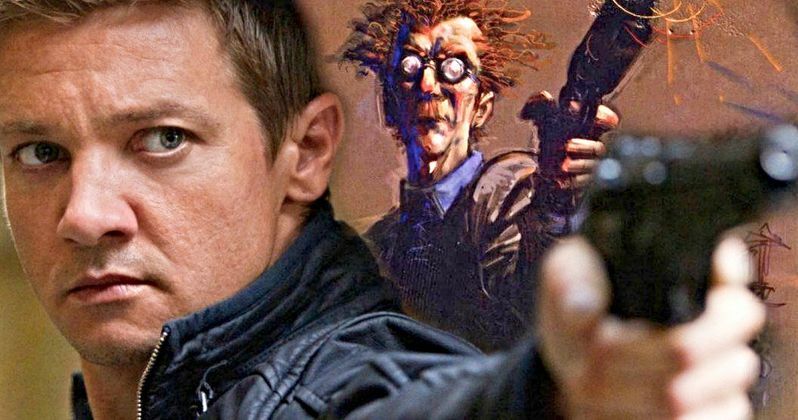 Jeremy Renner will star in Todd McFarlane and Blumhouse's Spawn reboot as officer Twitch Williams. There were reports about Renner's possible involvement last week, but it wasn't clear which role that McFarlane wanted him for, though he did mention that he was on a dream list along with star Jaime Foxx. Jeremy Renner can currently be seen on the big screen in the comedy Tag and he'll be making a return to the Marvel Cinematic Universe with next year's hotly anticipated Avengers 4 as Hawkeye after sitting out for Infinity War. Todd McFarlane released a lengthy statement about his reasoning for choosing Jeremy Renner to take on the role of Twitch Williams in the Spawn reboot. He states that Renner was at the very top of his list to be the face of the film. In the end, Renner agreed and he'll play a major part of the reboot. McFarlane had this to say. "As a first time director, I wanted to surround myself with the most talent and the most skilled people I can on all fronts. I was lucky enough to land Jason Blum and then Jamie Foxx, and I knew the person on screen the most is this police officer, Twitch Williams. We needed as strong a person as possible because he will be the face of the film. I took my naïve Hollywood approach again, and said let's start at the top and work down. Jeremy was at the top. I'm a huge fan of his. The character doesn't need to be a bodybuilder or GQ handsome. I was looking for somebody who's a person you've met before; I needed someone who can pull off the grief of an average human being. I've seen Jeremy do that in more than a few of his movies. He was at the top of my list, just like Jamie." Jason Blum of Blumhouse also weighed in on the choice of Jeremy Renner in the upcoming Spawn reboot. Blum echoed some of Todd McFarlane's comments when stating that Renner has the "everyman charisma." Blum also went as far as to say that Renner is the "ideal" choice to play Twitch Williams. He explains. "Jeremy is the ideal choice for Twitch Williams. He radiates honesty, intelligence and a hard-working, everyman charisma, the same qualities that make Twitch such a compelling character." Todd McFarlane has been talking about a proper Spawn remake for years, and to many, it seemed like the project was never going to happen. However, McFarlane has kept fans updated with pretty much every aspect of the development phase of the reboot, a film that he originally wanted to make in the style of Jaws with an R-rating. When news came down that Blumhouse was attempting to make the film on the cheap, fans started to get a little worried. But, that has all changed now that Jaime Foxx and Jeremy Renner are officially on board. Todd McFarlane created the Spawn comic series in the early 1990s and it immediately became a huge hit. A film adaptation was made in 1997, which didn't live up to the legend of the character or McFarlane's writing. The movie was widely panned and McFarlane is on a mission to erase the now 21-year old movie with a bold and dark interpretation. And who better to helm that project than the creator? You can read more about Jeremy Renner signing on to portray Twitch Williams in the Spawn reboot at Deadline.